EarthTronics 11.5 watt LED, LPD11M/G24d/840 easily replaces 18 watt G24d-2 base compact fluorescent lamps and provides 33% energy savings. It is physically the same form factor as the CFQ18W/G24d that it replaces. 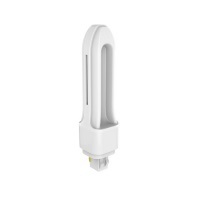 This 2-pin lamp produces 1100 lumens and works directly on the existing magnetic ballast. No rewiring necessary. Instant on, no warm up time and a long service life make this lamp an easy choice in many applications. Available colors include 3000K, 4000K and 5000K and the CRI rating is >80. The unique design illuminates nearly identically to the bulb it replaces and can be used in any rotation or orientation in open fixtures. The 25,000 hour rated life provides 3 times the service life of a typical compact fluorescent lamp. For use only on single lamp ballast. Not for use in enclosed fixtures.